I've had these products to review for a while now, but my vacation put me behind on testing them. I've also been itching to do a tutorial, but after coming back from vacation, I haven't been able to wear contacts for about a week and a half. Luckily my eyes are better so I could do a look! 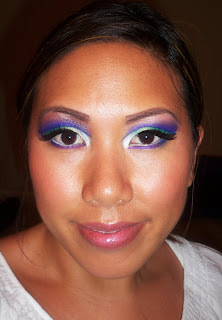 Check out my video tutorial to see my look! Onto my review! You might have already seen these double stack palettes. My first impression, "Whoa mama these are vibrant!" Out of all the pre-filled palettes I've tried out, these are the brightest...right up my alley! You can find these for $27.95 on Stars Makeup Haven. 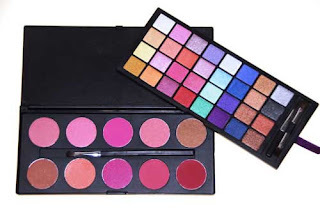 They're called double stack palettes because the first layer has a palette filled with 32 eyeshadows, and the second layer/stack has a palette filled with 10 blushes. Unfortunately the blushes are the same in both palettes...it would have been cool if the Matte palette had matte blushes and the Shimmer palette had shimmer blushes, oh well! The blushes in this palette are actually different from an individual 10 pan blush palette that I have. They are a little more pigmented which is a plus for the medium to dark skin tones out there...not quite as smooth as MAC blushes but definitely wearable. 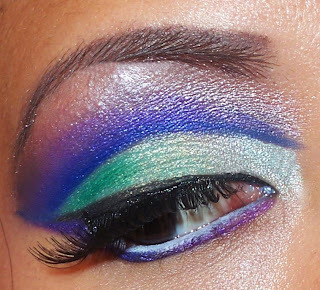 In terms of the eyeshadows, they are really fun, bright colors to work with. The consistency is harder than a lot of the other palettes out there, which I actually prefer so that way the eyeshadows don't crumble as easily. 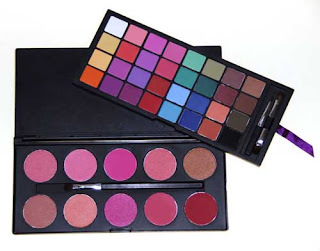 The colors are really super duper pigmented...you can do so much with these palettes. I definitely recommend them. I actually took both palettes and then put both stacks of eyeshadows in one palette and both blushes in another...most likely I won't be using the blushes as much as the eyeshadows...plus I like to have all of my eyeshadows in one place. In addition, I've been testing out SMH's single eyeshadows. 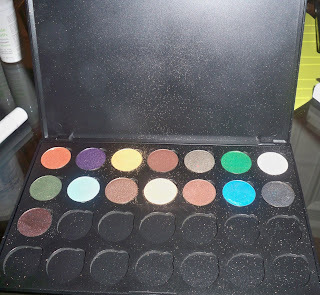 They are the exact size of MAC shadows and fit perfectly into SMH's magnetized 28 palette. The packaging of the eyeshadow is very nice...the whole pan is a shiny, heavy metal with the words printed directly on the back...IMO it looks even nice than the MAC shadow where you can see the exposed magnet on the back. At $4.95, these eyeshadows are very affordably priced. They come in a range of colors (currently 50 colors to choose from) from neutral to bright and bold. Here's a picture from Stars Makeup Haven with the shadows in her 15 pan palette. You can buy the pans and palette individually, or you can build your own 15 pan palette for $49.95. That's an amazing deal since if you bought all 15 pans individually you'd be spending $74.25 already, and that's without the empty palette. Great Deal! Or you can buy the 28 pan palette and fill it for $79.95...saving you $58.65 in eyeshadow alone! Just for comparison sake, if you bought 15 MAC pan eyeshadows, it would be already over $150...these are half the price. As you can see, it's better to do the "build your own palette" option...and they're not pre-filled, you can choose your own colors. Let me also mention that SMH's magnetized palettes are amazing! You really don't need to buy MAC empty palettes anymore...and no more adding magnets to anything, love love love! In terms of the consistency, the shadows are super smooth. Watch out though, because they're a little soft, my fingernail accidentally hit them a few times, leaving a nick on the surface. I tried some of these out in the Philippines and they were really nice. The color is vibrant and blends easily. They can be a little dusty, but just shake off the excess on your brush before applying and you should be fine. 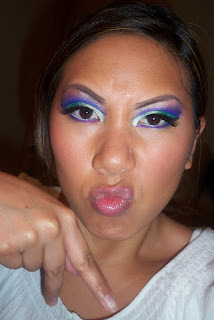 I paired this with my eyeshadow base from Steelo Cosmetics and they lasted all day. 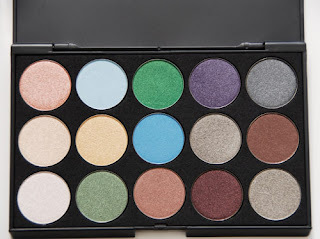 This is such a great alternative to MAC eyeshadows...I love how you can actually choose your own colors as opposed to the larger pre-filled palettes (88...96...120) where you end up not using a lot of the colors in the palette. 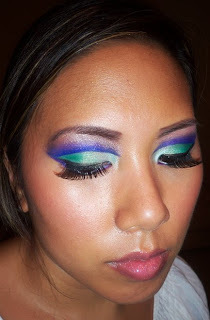 Check out the look I created with the double stack palettes and single eyeshadows! Check these out at http://www.starsmakeuphaven.com/ ! Stay tuned for my next video on Monday where I announce my Red Cherry Lashes contest! I just left you a comment on youtube. I love it, I really like the way you explained how to cut the crease, you make it look so easy so lets see if I can try, LOL. Keep the tutorials coming, JUST AMAZING. It is a pleasure to watch your tuts and reviews. I linked this entry to my blog. Thanks for your time! would you say starmakeuphaven's palette is better than coastalscent's? since they are about the same price.. Im looking to start my own kit and was wondering which one would be better.. o wait I think they are the same thing! yea! now that I know that they are good I'll def get them! thanks a lot for the review!